Are you handy? No, we don't mean can you hold your own when a seven foot biker accuses you of spilling his pint... we mean are you tooled up? If you own lots of different DIY tools you'll know that they, no matter how useful, take up a hell of a lot of space. If only there was something small, neat, and compact that could do the job of several other tools. There is, and we discovered all about it while reviewing the Dremel 4200 Multitool. 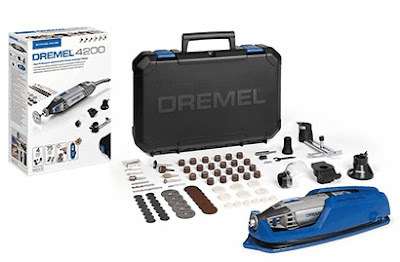 Dremel are world-renowned for making compact and handy multitools; the simple basis of all of them being that they are handheld tools that spin different kinds of head parts very quickly. Sanding, drilling, filing, carving, grinding... all are possible and more, with just one tool and plenty of small accessories. We've previously reviewed the Dremel 3000 Gold Edition, but the new 4200 Multitool has new advances to boast about. First up, the box contents. You get the 4200 itself, which, despite having a 175 W motor and an electrical cord (it's not cordless as some Dremel tool are) it is still slim enough to hold comfortably with one hand. You can get a 'lightsaber' grip of it, and even hold it stylus style for precision work. Included also are four attachments such as a safety guard and a precision circle cutter, and a whopping 75 accessories that are the business end of the multitool. There are several different grades of sanding heads, grinding heads, drill bits, cutting tools, polishers, and carvers. All that, and there is also a wall mount with cord wrap, and a carry case to boot. The stand out feature of the Dremel 4200 Multitool however, is the inclusion of the new EZ Change accessory swapping system. Changing from tool head to tool head is now as simple as pulling down on the two blue switches either side of the 4200's connection section, then doing the same when pushing in a new bit. Once in, that accessory ain't going nowhere, mate; both when we tried to roughly tug it out, nor when spinning the tool itself at maximum RPM. Its a great new system, and one that is a definite improvement over the older type. Speaking of which, revving the Dremel 4200 Multitool is a joy, and even on the fastest setting (the RPM is adjusted via a dial, then when the switch is pushed on it stays there, allowing you to free your fingers) it is relatively quiet and vibration free. We first used ours on a sanding job (details of that project, which was created using another of Dremel's new products, will follow in another review soon), and setting everything up, including installing the sanding part and plugging it in, took just a few seconds. The EZ Change system meant we could could literally plough through fiddly tasks which required different tools, dropping and changing bits in mere seconds. For DIY enthusiasts this is brilliant. Sure, you'll never use it for knocking holes in walls, but for pretty much everything else, especially those final finishing touch jobs, it is invaluable. If you're a crafter, a maker, or tinkerer, the Dremel 4200 Multitool will be your sonic screwdriver; capable of doing absolutely anything you want it to, and lickety quick as well.